It's driving well again with new key and such. Not sure why the key disintegrated or where it went, but I do have a good idea what happened. I do know when the key went on the engine, it went with a "POP". When I put the 820 back together the brake disk was pretty badly rusted. I figured the brake pads would clean it up. Turns out the brake disk ate away the disk pads to almost nothing. While trying to adjust the brakes, I ended up completely tightened it to a point I locked up the transaxle. That is why I sheered the key. I have 2 new pucks on the way. Meanwhile I will be polishing the brake disk. Before I go and try to work out the brake issues, I will see if this will resolve my issue first. For brake pucks, we just cut them out of used car brake pads... they're cheaper and last longer. I would love to do that, but I didn't have any on hand. Plus doing it that way, you can get a little taller puck. Now my tractor with the 2300 trans. That will be another story as it has actual brake pads. I may have to figure a way to adhere material to the metal pad backings. I think Li'l Red is an oil change and brakes ready now for Haspin. Looks like the pre-runner on the bumper has seen some use! Just a little bit. LOL, I've knocked a few weeds and small trees with it. @MightyRaze That's a NEW WINCH! I'm jelly of the remote! Now the question is... I hope to figure it out tonight. Granted it would only be an issue when they are together.... will the remote try to run both Kal and Red since they both have the same kind? I love having the one on Kal. They are useful for more than just pulling the tractor out of the mud. I used the one to pull our van out of the mud, pulled poles cemented in the ground. It's just handy. I got Kal's for like $30 with a super duper coupon I had last year and I got Red's with another super coupon and some $$ that was given to me on my birthday this year. Did you get that winch at Harbor Freight? 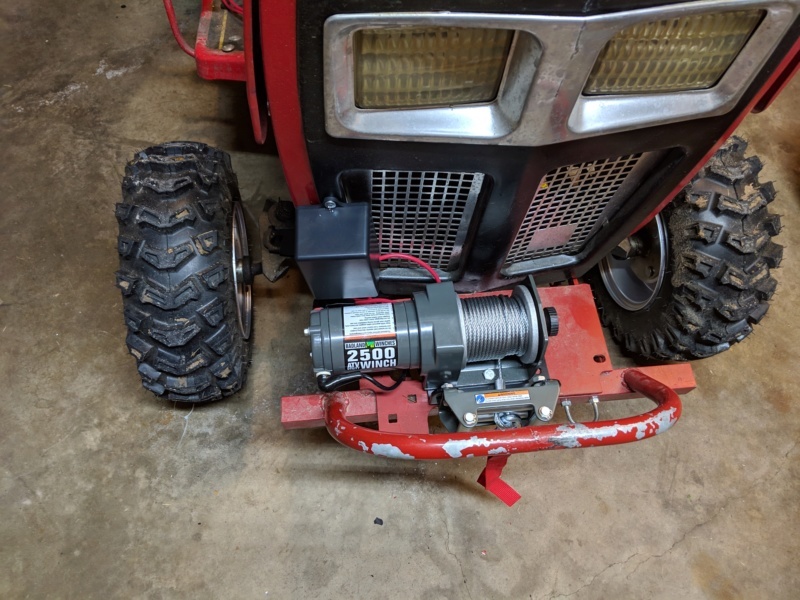 My brother just bought a winch exactly like it for his murray. seems like I need a Winch for my Rigs too! Brake Pucks came in and guess what.... she locks up hard now! Great news! Oil change, and hook the lights back up. I did find the winch on this one is a bit twitchy. I have not checked to see if the 2 winches clash. 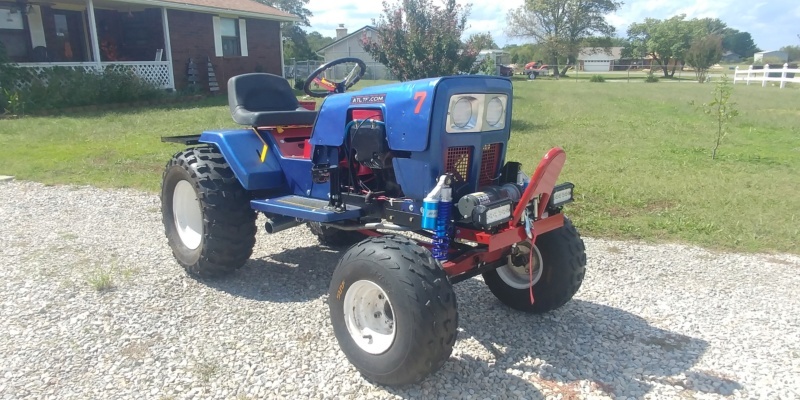 If so, I can add a cut off to the two tractors. Sounds like she's almost ready for Haspin. Wish I could find some 5x3.6 LED Rectangular lights. i've had a couple of the wireless remote winches from Harbor frieght and wasn't happy with them. they lag a bit and don't stop for a couple seconds when you release the button. so i wired mine to work with a toggle sw. through the wireless receiver. i like it a lot better that way but that's just me. One on my blue tractor Kal is pretty responsive. Okay so when my brother bought his winch HF told him that the remote is programmed to only operate that specific winch. They said if you lose the remote, your pretty much outta luck. So it shouldn't operate Kal. One thing I noticed in the winches was the one on Kal the wires come out in the screw sides, the one on Red come out on the non-screw sides. Looks like you're going to convert that wireless winch to wired. I can't live without the fine control in sticky situations on the trail. I really don't recommend wiring it to a toggle switch on the dash, maybe as a backup. When I actually use my winch, I'm either standing in front of or to the side of my tractor so that toggle switch is hard to reach. I really recommend wiring a socket somewhere where you can plug in a wired winch remote. 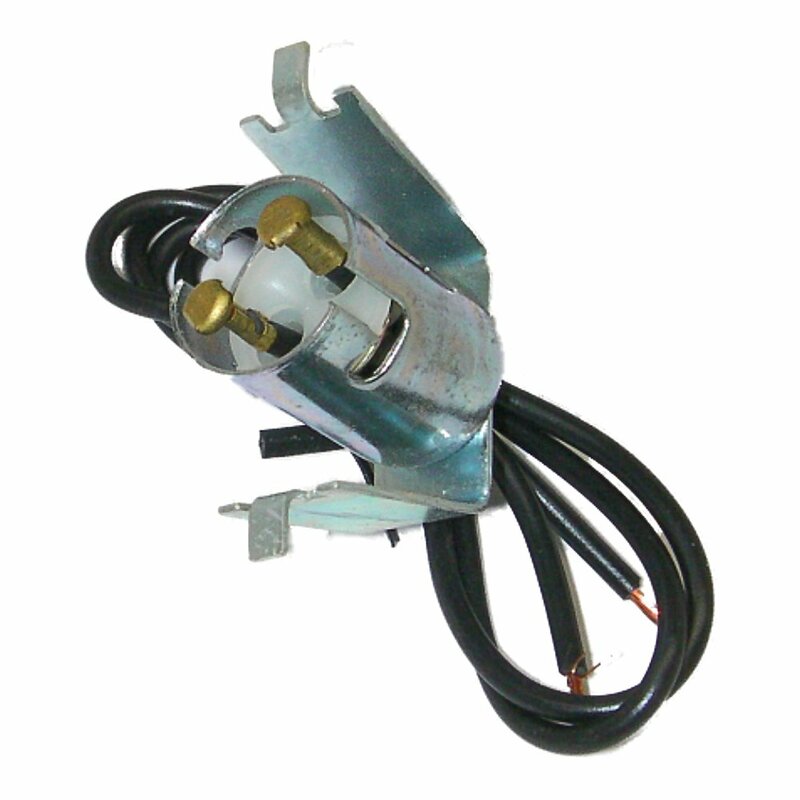 You'd have the functionally of the wired toggle switch with the flexibility of a remote. I was a bit confused about why people were adding the toggle because Kal's works so well. Now I see it with Red's. I figured dash. That way I could control the steering if needed too. Also, I have a hole in the dash I can use. LOL. i've got mine wired with a toggle sw on the dash it has worked great for me so far. OK, i figured out my lighting situation with Red. The problem was, I was missing one of the snap in bayonet sockets for my headlights. I made one out of some scraps and it worked ok, but would go off and on a lot. I have found 2 new sockets for Red, and I will be replacing the standard twist in lights with LED ones. That should work good. So your saying that your gonna change the bulbs, Or the whole assembly?